A Passenger Sued Southwest Airlines for Exactly $74,999 and It's Totally Brilliant. People asked: "Why not just round it off to $75,000?" Here's why not. You may have heard: A Southwest Airlines passenger is suing Southwest for landing at the wrong airport. It's the kind of case we talked about back in law school, and I was intrigued enough to dig up the court complaint down in Missouri. I've included it at the bottom of this story. "Plaintiff is requesting damages in the amount of $74,999.99 and nothing more." It's an odd strange number, right? It turns out there's a smart strategic reason behind the decision to use it--heck, I'd call it brilliant. Below, we'll go through this strange case, why the plaintiff is suing for exactly one penny under $75 grand, and what all of this means for you as a business leader. Quick, important fact: There are two airports servicing tiny Branson, Missouri: Branson Airport, which at the time had regular Southwest Airlines service, and the smaller Taney County airport, with a runway barely half the length of Branson's. Somehow, the captain and first officer of Southwest Flight 4013 from Chicago mixed up the airports--which are only seven miles apart--and landed at the wrong one. Nobody was physically injured--but careers were ended and things could have been much worse. Passengers allegedly had to wait for two hours after landing before being allowed off, while the plane was filled with smoke. "We landed very abruptly with the pilot applying the brakes very hard. We smelled burnt rubber from the stop," another passenger (not the plaintiff in this lawsuit, as far as I know) told Forbes at the time, adding: "[T]he mood is somber now that we realized we were 40 feet from the edge of a cliff." The passenger who sued Southwest, Troy Haines, lived in the area and had flown into Branson Airport many times, and says he realized well before the plane landed--even if the pilots didn't--that they were at the wrong airport, "with a much smaller runway." He was "immediately struck with fear and anxiety over potentially crashing," according to his lawsuit, and he later "suffered severe mental anguish, fear and anxiety, including a panic attack which caused him to be removed from another airline prior to take-off." That in turn led him to stop flying, which meant taking a job that didn't require travel--"at a substantially diminished salary." Whether you think the lawsuit sounds reasonable or not, the big question is simply: why not just round things up a penny and ask for $75,000. The reason stems from the fact that there are two U.S. court systems: the federal system and the state systems. And, even if a plaintiff files a suit in state court, the defendant can sometimes move ("remove it" in the legal language) it to federal court. Most often, the defendant does this by showing that the plaintiff and defendants are from different states--but also that the amount at stake is more than $75,000. Suing for exactly one penny less than that blocks Southwest from removing the case to the federal court. "It's clear [the plaintiff in this case] wants to be in state court and is therefore staying under the monetary threshold for removal to federal court," said Paul Geller, an experienced civil litigator and a partner at New York-based Robbins Geller Rudman & Dowd, who is not involved in this case. "While I don't necessarily ascribe to it, there is a general overlay in litigation that plaintiffs want to be in state court, and defendants try to find any way to get to federal court (through removal, where permissible)," Geller continued. "Flight Options Plummet at Branson Airport"
Geller went on to call the idea that state courts are always more plaintiff-friendly "an urban myth." And I think he might be right, in many cases. But here, several things make filing (and staying) in state court utterly brilliant, in my opinion. If you're a business owner, or you can ever imagine being a party to a civil lawsuit, you'll want to pay attention. First, there's the fact that five months after this incident--June 4, 2014--Southwest stopped flying into Branson. You can imagine why this might make sense, business-wise: Taney County, where Brnson is located, only has about 51,000 year-round residents, although it is a tourist destination. Still, when Southwest left (along with Frontier soon after, the only other big airline that had served the area), the airport was hit hard. In fact, the last time news broke that Branson might be attracting a major carrier, it was all part of an elaborate April Fool's joke on the part of Sir Richard Branson (same last name as the city), the CEO and founder of now-defunct Virgin America. I don't know the exact economic impact of the airport's demise. But I'm sure it caused damage, as outlined in one newspaper article: Flight options plummet at Missouri's new Branson Airport. And I'm also confident that seeing your hometown dismissed as too insignificant for commercial flights has to sting. All of which might make the plaintiff want more Branson-area jurors, while Southwest might want to everything it could to try this case as far away as possible. The closest federal court to Branson is 50 miles north, in Springfield. That means that if Southwest Airlines could remove this case to federal court, they'd be able take it right out of the immediate county where this all happened--a community that Southwest decided a few years ago isn't significant enough for its business. And this isn't just about the location of the courtroom; to my mind it's about the makeup of the jury pool. Find jurors closer to Springfield, Missouri, and they might not feel one way or another about Southwest. But pull together a jury in Branson, and a reasonable lawyer might imagine you'd wind up with a some who maybe knew someone who lost a job after Southwest and Frontier pulled out, or who don't like that the big airlines think their hometown is just a punchline. In other words, maybe you assume that a Branson jury would be predisposed to find for a plaintiff who lived in your town, and who isn't asking for all the money in the world--and would find against the giant corporation with the out-of-state headquarters that allegedly did him wrong. So you'd want to keep things in state court, in Branson. And because the plaintiff asked for one penny less than is required for a removal to federal court, Southwest seems stuck. Brilliant, to my mind. Or else maybe this is all just about making it harder for Southwest's lawyers and witnesses to travel to the trial in Branson. Because as we've seen, Southwest doesn't fly there anymore. The flight crew briefed a plan to have radar vectors to the final approach course at Branson Airport and to use the RNAV (GPS) Runway 14 to line up on the final approach. The flight crew programmed the flight management system for the approach and set up the onboard navigation systems accordingly; including the use of distance measuring equipment from another approach navigation aid to provide additional situation awareness. During descent, the flight crew discussed the navigation information displayed, compared it to the lights they could see on the horizon, and confirmed what they believed to be the airport beacon based on that comparison early in the descent. The approach controller cleared the flight direct to the final approach fix depicted on the RNAV approach to the runway of intended landing. While still about 20 miles from the destination airport, the approach controller advised the crew the airport was located at their 11 o'clock position and 15 miles although at the time, that position more closely approximated Downtown Airport. Branson Airport was slightly left at their 10 o'clock position and almost 20 miles. The flight crew called the airport in sight and accepted a visual approach clearance and handoff to Branson control tower. Upon checking in with Branson Tower, the crew was cleared to land on runway 14 at Branson. When the crew identified what they believed to be Branson Airport early in the descent, they did not crosscheck or verify the airport position using onboard navigation after that point. Perceiving they were a little high on the approach into Downtown Airport, they widened the base leg for descent and then descended below approach control radar coverage as they turn onto final approach. Therefore, from the perspective of the approach controller this appeared to be a normal flight path into Branson Airport up to the point when radar contact was lost. Instead, the flight crew lined up on final approach to runway 12 at Downtown Airport and proceeded to land. The captain recognized the error soon after touchdown when he realized the runway was shorter than expected and he applied maximum braking, coming to a stop about 300 feet from the end of the paved surface. The Flight crew's failure to properly identify the airport and runway of intended landing. Contributing to the incident was the flight crew's failure to comply with procedures for use of navigation information and visual cues to verify the airport and runway of intended landing and the air traffic controller's issuance of erroneous airport geographic information without including the location of proximate airports. On January 12, 2014, about 1810 Central Standard Time (CST), Southwest Airlines flight 4013 (SWA4013), a Boeing 737-7H4, registration N272WN, mistakenly landed at M. Graham Clark Downtown Airport (PLK), Branson, Missouri, which was 6 miles north of the intended destination, Branson Airport (BBG), Branson, Missouri. 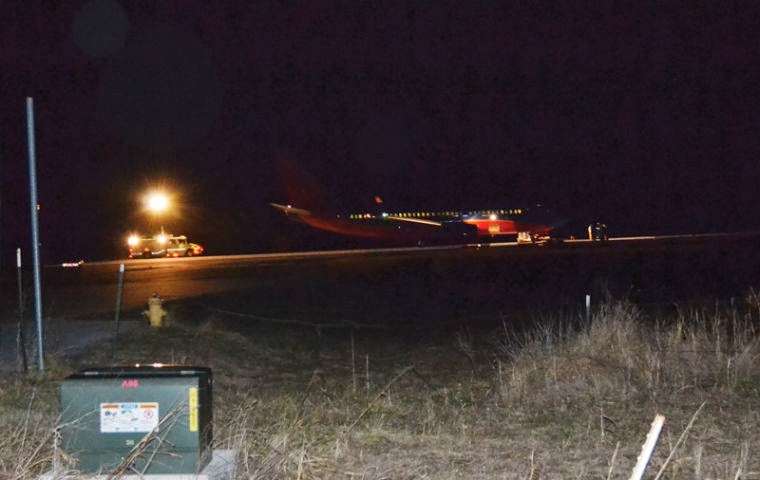 The flight had been cleared to land on runway 14 at BBG, which was 7,140 feet long, however, landed on runway 12 at PLK, which was 3,738 feet long. There were no injuries to the 124 passengers and 7 crewmembers and the aircraft was not damaged. The aircraft was being operated under the provisions of 14 Code of Federal Regulations (CFR) Part 121 as a regularly scheduled passenger flight from Chicago Midway International Airport (MDW), Chicago, Illinois. Night visual meteorological conditions prevailed at the time. The flight was scheduled to depart MDW at 1545 CST but due to delays from the previous flight, did not depart until 1643 CST.. The first officer was the pilot flying, the captain was the pilot monitoring, and a company dispatcher occupied the flight deck jumpseat as an observer. During preflight preparation the first officer loaded the flight plan into the flight management computer (FMC). The departure and initial climb were uneventful. At 1702, after climbing through 18,000 feet, the crew initiated a discussion about the planned landing runway at BBG. The first officer indicated he had been there only one time before when he had landed on runway 32. At 1708, the crew discussed the wind conditions at BBG and agreed runway 14 would be used for landing. They discussed the fact that runway 14 was not served by an ILS approach and that they would conduct a visual approach backed up with an RNAV instrument approach and use of the Heads Up display (HUD). The captain stated that he was setting up distance measuring equipment (DME) from the runway 32 localizer in his avionics. From 1708 to 1734, the crew discussed the airplane fuel system and the fuel crossfeed operations required due to the airplane having inoperable equipment deferred in accordance with the Federal Aviation Administration (FAA) approved minimum equipment list. At 1727 the first officer began to brief the approach into BBG. He indicated a plan to have radar vectors to the approach and let the RNAV line them up for a visual. He noted the inbound final approach course was 143 degrees and the touchdown zone elevation was 1,278 feet. The crew then engaged in a discussion regarding the after landing taxi route to the gate. After the first officer initially indicated they would not need to make a 180 degree turn on the runway to taxi back to the gate, the captain prompted further discussion and the crew agreed they would need to make a 180 degree turn on the runway when landing from this direction. At 1744 Air Traffic Control (ATC) cleared the flight to descend to 24,000 feet and at 1746 cleared the flight direct to BBG. At 1750 the crew received the current BBG automated terminal information service (ATIS) weather report via radio indicating runway 14 was in use and a few minutes later, as the airplane descended through 18,000 feet, the first officer called for the descent checklist. At 1752:22, when the flight was approximately 60 nautical miles northeast of BBG, ATC cleared the flight to descent to 4,000 feet, advised them to expect a visual approach to runway 14, and to proceed direct to VUCUG intersection, the final approach fix on the RNAV (GPS) runway 14 approach. At 1752:53 while conducting the descent checks, the crew noted that they were putting a 5 and 10 mile ring around "it" in reference to BBG airport on their navigation display. During the next few minutes, the crew (including the observer occupying the jumpseat) discussed the navigation fixes and stations on the navigation display and compared them to the lights visible from the flight deck. They confirmed which lights they believed to be Branson and which lights they believed to be Springfield. At 1800:10 Springfield ATC advised BBG tower that SWA4013 was 20 miles northeast of BBG for a visual approach to runway 14. At 1801:57 the first officer said "well I see the beacon down there…no runway yet." At 1802:06 the captain said "I think that's it. I see a bunch of bright white lights to the right and just a little to the left of the beacon." About 1802:51 ATC advised the airport was located at "…eleven o'clock and one five miles." At 1802:57, after the crew conferred, the captain responded to ATC "…field in sight." At 1803:00 ATC cleared the flight for a visual approach to runway 14, terminated radar service, and advised the flight to contact BBG tower. At 1803:15, the captain reported to BBG tower that the flight was descending out of 6,600 feet for 3,000 feet direct to VUCUG for a visual approach and the BBG tower controller cleared them to land on runway 14. From 1805:41 through 1808:09, the crew configured the airplane for landing, deployed flaps, landing gear, and completed the landing checklist. The crew then exchanged callouts regarding speed, altitude, glidepath, and sink rate until touchdown on runway 12 at PLK at 1809:15. The airplane touched down about 300 feet past the displaced threshold. During the landing roll, following callouts for operation of the speedbrake, thrust reversers, and autobrakes, the captain stated "this ain't it" and the crew applied maximum braking. The airplane came to a stop about 300 feet from the end of the paved surface for runway 12. At 1809:45 the captain called BBG tower and stated "I assume I'm not at your airport." There were no injuries to the 124 passengers and 7 crewmembers. The crew consisted of two pilots, three flight attendants, and a company dispatcher who occupied the flight deck jumpseat as an observer. The Captain, age 58, was hired by Southwest Airlines in June 1999 as a first officer on a Boeing B-737. He upgraded to captain on the B-737 in July 2005. The captain reported approximately 15,700 hours total time including about 9,035 hours pilot-in-command and 10,400 hours on the B-737. There was no record of previous aviation incidents, accidents, or enforcement actions involving the captain. He held a valid FAA Airline Transport Pilot (ATP) certificate with type ratings for DC-9, BA3100, and B737, and a current FAA first-class medical certificate with no limitations. The captain stated in an interview that since his last FAA medical evaluation, he had started to wear glasses and that he was wearing them at the time of the incident. The first officer, age 62, was hired by Southwest Airlines in June 2001. He reported 20,538 hours total time including 9,880 hours in the B-737. There was no record of previous aviation incidents, accidents, or enforcement actions involving the first officer. He held a valid FAA ATP certificate with type ratings for BA3100, BA4100, and B737, and a current FAA first-class medical certificate with a limitation stating that he must have available glasses for near vision. He indicated in an interview that he was not wearing the glasses at the time of the incident. Company records indicated the first officer had attempted an upgrade training event to become a captain on the B-737 but received an unsatisfactory grade during the Line Oriented Flight Training (LOFT) portion of the training in December 2011. He re-entered upgrade training on January 4, 2012 for "situational awareness training", and received an unsatisfactory grade during the LOFT for the second time on January 5, 2012. He then returned to line flying as a first officer. Company records indicated the captain had not flown to BBG before, and the first officer had flown into BBG one time previously on June 24, 2013. The captain and first officer had started the first day of their respective trips together but were then separated, flying different flight schedules until meeting again to fly on the third day. The incident flight was the second flight on the third day of the captain's 3-day trip and the first flight (following two deadhead legs) of the third day of the first officer's 4-day trip. At the time of the incident, the captain had been on duty for approximately 8 hours and the first officer had been on duty for approximately 10 hours. The incident airplane, manufacturer serial number 32527, was a Boeing B737-7H4 equipped with two CFM International CFM56-7B24 turbofan engines. The certificated maximum gross weight of the airplane was 154,000 pounds, the maximum landing weight was 128,000 pounds, and the actual landing weight was 124,763 pounds. Company records indicated that the airplane was operated on the incident flight with two deferred maintenance items. The number 2 aft fuel boost pump and the right retractable landing light were both inoperative and deferred in accordance with the FAA-approved minimum equipment list. There was no official aviation weather observation recorded for PLK. The aviation routine weather report (METAR) recorded at 1747 and reported as ATIS information Delta at BBG, approximately 6 miles south of PLK, indicated wind from 150 degrees at 12 knots gusting to 23 knots, visibility 10 statute miles, few scattered clouds at 25,000 feet, temperature 17 degrees Celsius, dewpoint minus 2 degrees Celsius, altimeter setting 29.70 inches mercury, and visual approaches for runway 14 in use. The flight crew received BBG ATIS information Delta via radio and the BBG METAR via the ACARS (Aircraft Communications Addressing and Reporting System) about 20 minutes prior to landing. The crew briefed a plan to conduct a visual approach and use the RNAV approach as a reference. The RNAV (GPS) Runway 14 was a straight in approach that began over WUTIB waypoint at 4,000 feet, proceeded to cross VUCUG, the final approach fix, at 3,000 feet on an inbound course of 143 degrees. A vertical descent path began at VUCUG which was located 5.2 miles from the end of BBG runway 14 and about 2 miles southwest of PLK. There was no localizer based approach to BBG runway 14 though DME was available from the runway 32 localizer frequency. No communications problems were noted at any time during the incident. FAA order 7110.65, "Air Traffic Control", stated, in part, that Air Route Traffic Control Centers (ARTCC) and approach controls may clear aircraft for visual approaches using the following procedures: "In those instances where airports are located in close proximity, also provide the location of the airport that may cause the confusion." When ATC communicated the airport location and provided an approach clearance to the flight crew, the approach controller did not provide the location of other airports in the area. Branson Airport is located 8 miles SSE of Branson, Missouri at an elevation of 1302 feet above mean sea level. The airport has two runways, 14 and 32. The runway of intended landing, runway 14, is grooved concrete 150 feet wide and 7,140 feet long with available landing distance of 7,140 feet and a touchdown zone elevation of 1,278 feet above mean sea level. The runway is served by a 4-light precision approach path indicator with a 3 degree glideslope on the left side of the runway, runway end identifier lights (REILs) and high intensity runway edge lights. Air traffic control services at Branson Airport are provided by a federal contract tower. Airfield lighting was controlled by the air traffic control tower personnel during hours of tower operation from 0700 to 2100 daily. M. Graham Clark Downtown Airport is located 1 mile south of Branson, Missouri at an elevation of 940 feet above mean sea level. The airport has two runways, 12 and 30. Runway 12 is grooved asphalt 100 feet wide and 3,738 feet long with a displaced threshold of 289 feet providing an available landing distance of 3,449 and a touchdown zone elevation of 940 feet above mean sea level. The runway is served by REILs located at the displaced threshold and medium intensity edge lights. There is no visual approach slope guidance for runway 12. There was no ATC control tower located at PLK and airfield lighting was activated by a pilot controlled lighting system operating on the common traffic advisory frequency. The cockpit voice recorder (CVR), a Honeywell model 6022, serial number 09032, was removed from the airplane and downloaded at the NTSB Vehicle Recorder Laboratory. The CVR contained 2 hours, 5 minutes of recording on two sets of audio data files; a 2-channel recording containing the last 2 hours of recorded data and a 4-channel file containing the last 30 minutes of recorded data. The audio quality of the channels containing information from the captain's and first officer's audio panels, was characterized as excellent, and the audio quality of the channel containing information from the cockpit area microphone was characterized as good. The recording included events from the flight beginning with the departure climb out of 10,000 feet, and ending when the CVR was deactivated about 53 minutes after landing. Timing on the CVR summary was established by correlating CVR elapsed time to common events on the flight data recorder (FDR) and adjusting to local CST. The FDR, a Honeywell Model 980-4700, serial number 10856, was removed from the airplane and downloaded at the NTSB Vehicle Recorder Laboratory. The recorder arrived in good condition and contained approximately 27 hours of data which was extracted normally. Correlation of the FDR data to event local time, CST, was established using the recorded GMT (Greenwich Mean Time) parameter. On January 13, 2014, the captain and first officer complied with a company request to submit to drug and alcohol screening tests. Results of these tests were negative for alcohol and major drugs of abuse. Southwest Airlines is owned and operated by Southwest Airlines Co. who also owned Air Tran Airways. Southwest Airlines is based in Dallas, Texas. As of December 31, 2013, Southwest Airlines and AirTran Airways together operated flights to 96 destinations in the United States, Aruba, the Bahamas, Dominican Republic, Jamaica, and Mexico with a fleet of 614 Boeing B-737's and 66 B-717's. AirTran Airways started service into BBG in 2009 and Southwest Airlines added service to BBG in March 2013. In December 2013 Southwest Airlines announced they would cease operations in BBG effective June 7, 2014. 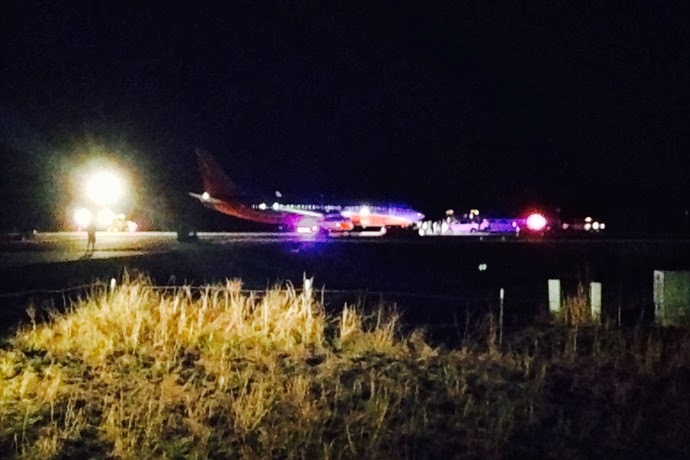 The incident aircraft is owned by Southwest Airlines Co. and operated by Southwest Airlines for common carrier passenger operations. Approach control services were provide to SWA4013 by an approach controller at Springfield Terminal Radar Approach Control (SGF TRACON) and the airport ATC services were provided by BBG Air Traffic Control Tower (ATCT). BBG ATCT, a federal contract tower, did not have radar monitor capability and both BBG and PLK were located at elevations below SGF radar coverage. Interviews with SGF controllers indicated that radar coverage ceased and radar contact was normally lost for aircraft arriving BBG when they descended below about 2,200 to 2,600 feet and no minimum safe altitudes alerts were triggered for SGF controllers for this flight. The BBG tower controller indicated he normally kept the runway edge lights off, in order to save money, until an aircraft was reported on arrival. FAA order 7110.65, "Air Traffic Control", stated in part, to turn on runway edge lights, from sunset to sunrise, for instrument flight rules arrivals before the aircraft begins final approach or for visual flight rules arrivals before the aircraft enters Class B, Class C, or Class D surface area associated with the airport. There were no records or airfield lighting system recording capability to determine when the runway lights were turned on at BBG. The BBG tower controller indicated in an interview that he had turned on the runway edge lights after receiving notification from SGF TRACON at 1800:10 that SWA4013 was inbound. Prior to that time, he stated that only the runway end identifier lights and the precision approach slope indicator had been on for the runway of intended landing. The flight crew conducted a briefing for a visual approach to runway 14 using an RNAV approach as a reference on the navigation display. During the approach briefing, the crew discussed the final approach course, the touchdown zone elevation, and the runway and airport layout. There was no discussion of airport lighting or visual approach path guidance. The Southwest Airlines AOM required pilots to conduct an approach briefing prior to every approach. The AOM indicated that for visual approaches under visual meteorological conditions, flight crews must brief the final approach course and navaid frequency of the charted instrument approach for the expected runway. Although the procedures did not specify that airport lighting should be included in a briefing for a visual approach, interviews with Southwest Airlines personnel indicated that some pilots would include this information in their approach briefings. The Southwest Airlines AOM Approach Briefing Requirements for an instrument approach specified that runway and approach lighting was to be reviewed during the briefing. Following this incident, Southwest Airlines revised the AOM to include runway lighting as a component in visual approach briefings. During the approach brief and preparation, the crew had programmed RNAV approach guidance in the FMC and was navigating direct to the final approach fix. The crew stated they setup 5 and 10 mile distance rings around BBG on their navigation displays, and the captain stated he setup DME from runway 32 localizer to provide additional situation awareness. Once they had what they believed to be BBG in sight, the crew stated that they did not reference on board navigation guidance and transitioned to outside visual reference. The Southwest Airlines Flight Operations Manual included specified pilot flying and pilot monitoring duties and required that flight crew members monitor flight and navigation instruments and crosscheck for consistency and accuracy. In addition, the Southwest Airlines AOM provided guidance indicating that flight crews should, when conducting a visual approach, reference an issued charted procedure contained in the FMC navigation database to assist with lateral and vertical guidance to the correct runway. During the approach, the captain stated he used the heads up display (HUD) in VMC (visual meteorological conditions) mode. Southwest Airlines procedures do not require use of the HUD, which is only installed on the captain's side, for visual approaches but provides guidance allowing the HUD to be used in VMC mode. Southwest Airlines AOM guidance indicated that when using the HUD in VMC mode, the alignment with the landing runway should normally be accomplished by visually acquiring the runway and maneuvering the aircraft using outside references. The HUD could be used for descent rate reference in VMC mode by adjusting rate of descent to hold a reference line over the point of intended touchdown. The HUD does not provide navigation or flight director guidance in VMC mode.